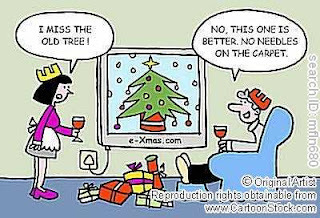 Time for the seasonal Christmas Tree Conundrum - fresh or fake? 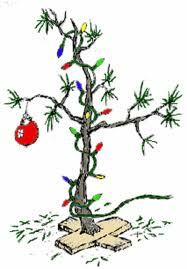 Purists will always choose a real tree and those worried about the environment or who do not want the mess of watering and sweeping up dead needles go for the fake tree. I think our heritage also plays large part in the decision. Traditions call us this time of year in particular and it's hard to not feel the call. My earliest memories of our own family Christmas trees always involved a fresh one. My mum and dad would bundle us into the car and head off to the lot to pick out one both suitable and in our price range (actually quite conflicting requirements). I was a difficult child to say the least and looking back still cannot believe they put themselves through this ordeal every year. We started out walking through the large lot and I would quickly hone in on THE TREE. The next 30 minutes or so were spent trying to give everyone else a say while I very firmly held my ground until the tree was purchased. One year, much to my mum's horror, I decided that we had to have a flocked tree - the newest rage. We couldn't afford one from the lot so she unfortunately thought the fight was over. How could she so underestimate me? When flocked trees first came out they actually sold a DIY can in the hardware store that you could spray on your tree and that's what we eventually did. It only took one year for me to realize what a stupid concept it was. The flocking made it hard to hang the ornaments and fell off like dandruff over the few weeks the trees was up. Dead needles and dry powdery flocking rained off as we tried to move the tree out of the house. However, I would never in a million years admit I was wrong. Fortunately at some point I grew up a bit and the hunt for a tree became a little easier. At age eleven my family moved from South Dakota to Sacramento, California. The church we attended there had the best holiday tradition. Each year every family that wanted to help pick out the enormous tree for the sanctuary would hop in their car and we would all head up into the local mountains. There some enterprising soul had purchased a large track of forested land. Who actually picked out the tree for the church and how they got it back into the city, I have no idea. We all trudged through the snow, axe or small chain saw in hand, to find that perfect tree for our own homes. Something about being out in the actual forest hiking through the snow and the smell of chopping down a real live tree imprinted this occasion on my memory like no other. It is to this day my fondest Christmas memory. All I remember is the mountains, the snow and smell of our own freshly cut tree. When my parents moved to Los Angeles, the family Christmas became far removed from those type of memories. Let's face it, by the time the trees make it to a lot in LA (temperature sometimes in the 80's F), it's been a long time since it was been cut down. 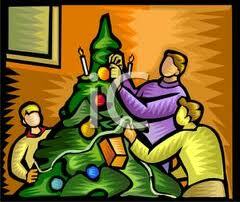 The family tree began to get smaller and smaller and was perched up on a small table. My mum always held onto the tradition of a real tree no matter how small and, fortunately for me, both my husband and I are of the same mind. Glen is the total Christmas Bah-Humbugger (a new term I invented just for him), so anything that helped him get in the mood was a great thing. He loves a trees that is not too dense - just even branches with open space between so that you can see the ornaments. Decorating the tree is a dad and kids event which I help with by laying out the ornaments and keeping the fire stoked. 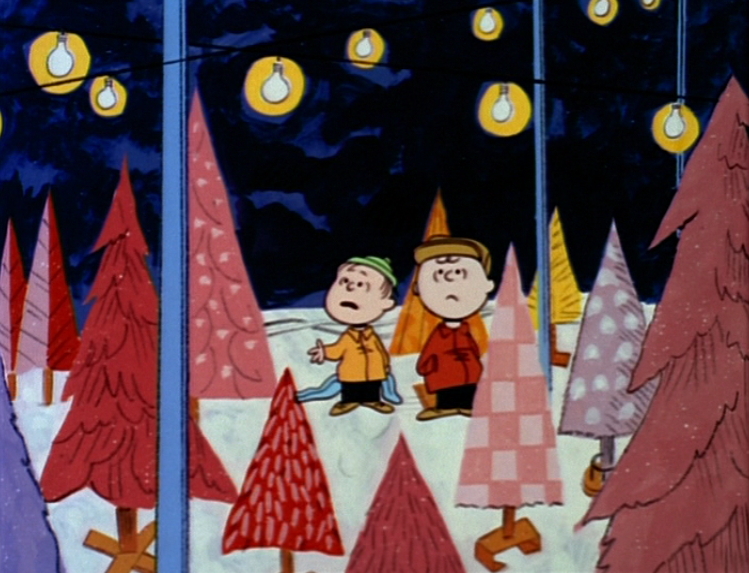 Some years we waited too long and ended up with the Charlie Brown special and one year I mistakenly got my tree from Ikea. It came in the house dead and showered pine needles the whole time, but it was a real tree and that's all that mattered. I had always wanted to take Glen and the kids (we had three) to the Los Angeles for Christmas with my family. Finally I saved enough money one year for the plane tickets. Now the question was a difficult one - real or fake. We finally broke down that year and bought a tacky two foot fake tree. It had sprays of optic fibre throughout that rotated through a rainbow of colours. It sat on the hearth next to the fire and when we turned off all the lights, it was actually a bit hypnotic. This fake tree has wormed it's way into my heart. We all still want the real tree if we are having Christmas at home, but the small, plug-in one has become a part of our holiday traditions in a way that has surprised me. It still has a place of honour on the hearth and at some point each year we put on the holiday CD's, light a real fire, plug in both trees and turn the lights off. I could sit there for hours. 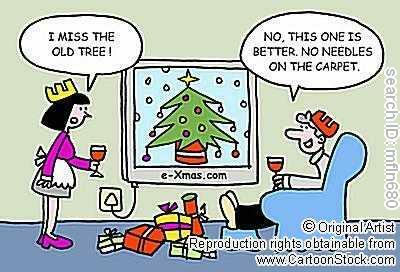 The Christmas Tree Conundrum will always be one each family has to face. Despite the horror I felt the first time I walked through one of those weird fake Christmas tree stores at the mall, I could see the writing on the wall. Concerns for the environment, our very fast paced lifestyle and praticality will probably take us down this road more and more. Once established, it will be the new holiday tradition. I will always feel grateful I had the opportunity to do it old school, to trudge through the mountains in the snow and breathe in the wonderful scent of a freshly cut tree. Q: How do chickens dance at the Christmas party? Q: Why would you invite a mushroom to a Christmas party? Q: Who sings "Love Me Tender" and makes Christmas toys? 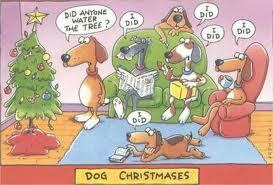 Q: Which of Santa's reindeers needs to mind his manners the most? Q: What can Santa give away and still keep?